Juggling is a complex artistic task. Obviously, this is due to the difficulty of throwing and catching several (possibly different) objects in an aesthetical manner. In order to master this complexity the juggler needs to develop automatisms. These allow her to spend less attention on the particular single throws, and instead focussing on more complex struc- tures, i.e. patterns, and the process of switching between them. Training situations in particular require that the artists monitor their juggling movements in order to achieve a reasonable level in both, technical and aesthetical terms. This is the case, especially when precision and hand to hand symmetry has to be trained. 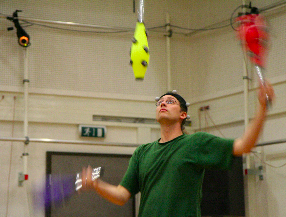 The JUGGLING SOUNDS setup aims at supporting such training situations as well as the actual performances by re flecting the motions of juggling clubs in realtime using spatialized sounds surrounding the artist and –in a performance– the audience, too. In order to ensure that the sonification covers as much of the available information of the juggling performance as is needed, the system uses both direct mappings of low-level feature-streams and detected events for the sound synthesis. In the paper we describe general approaches to design auditory displays for realtime analysis, and focus on the application of juggling. It gives an overview of the used hardware and software setup, and describes the currently used features and their sonification in relation to the juggling movements.